I’m always looking for activities for my kids that cost me very little money, are easy, and use what I already have in my house if possible! 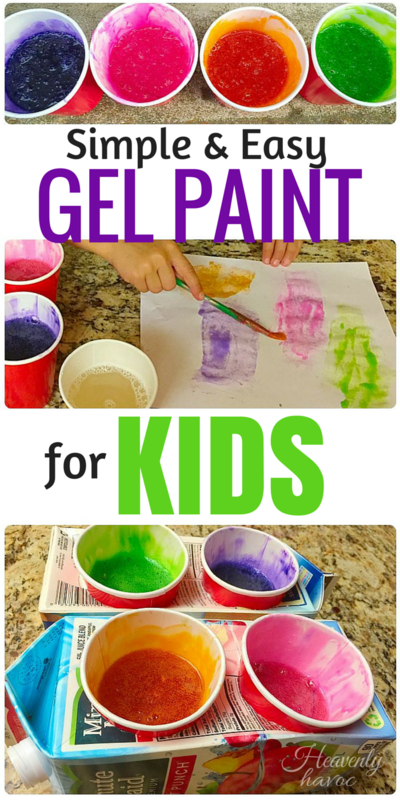 I came up with this gel paint for kids on a whim about 8 years ago when my husband was still in college and we were as poor as church mice. My kids still love it today! The best thing about this super easy paint is that it is loads of fun in the tub too! If you are having a hard time getting your kid to take a bath, or getting them to CLEAN themselves, this paint will do the trick! It’s lots of fun and gets your kid clean at the same time! That being said, it’s also fun to use on paper, or even on sidewalks or driveways! You might be wondering why I have my paint cups inside juice boxes. There’s a method to my madness! My kids are famous for knocking over paint cups. By cutting out holes in 2 quart drink cartons, it makes it a WHOLE LOT HARDER for them to tip over the cups and easier to transport them! Genius right? Okay, here is the SUPER SIMPLE way I make this paint. It’s SHAMPOO…and Food coloring! I buy the cheapest shampoo I can find that’s clear or light colored (white would probably work too!) and I just add food coloring and stir! Done…and lots of FUN! You can also add a little cornstarch to the shampoo to make the consistency a little thicker. If it’s too thin, add more cornstarch, if it’s too thick , add a little water! Experiment and see what works best for you. If you want to use this in the tub, and you are afraid of your child getting it in their eyes, just use your favorite tear free shampoo or kids body wash.
Have fun with your new paint!